KEF announces super-slim T Series speaker system | What Hi-Fi? You can see and hear KEF's new super-slim T Series here at Manchester, and find out more about them in our video news report. We hope to get them in for review soon. 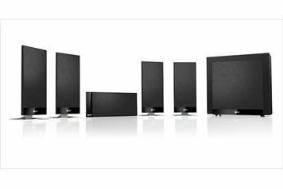 KEF has announced a brand new, slim profile home cinema speaker range, designed to complement ultra-thin flatscreen TVs without compromising on sound. The T Series incorporates a completely new ultra-low profile bass and midrange driver alongside a large, fully vented new tweeter. The new drivers sit within 35mm deep cabinets that KEF claims will perform as strongly mounted on a wall as on the proprietary stands thanks to an innovative crossover design. Crossover components are hidden inside the stands themselves ensuring sound is adjusted for optimum performance when the speakers are stood in free space. The T105 system is the first of three systems scheduled for release, and comprises four T101 satellites, a T101c centre channel and a slim profile T-2 subwoofer. The T101 satellites include one 25mm vented tweeter and one 10cm low frequency driver. Joining the T105 will be the T205 and T305 systems. The two systems will incorporate the larger T301 and T301c speakers. The T205 will have one pair of T301 speakers at the front, and a pair of T101s at the back, while the T305 system will use T205 speakers throughout. KEF has developed the closed box design T Series from work on the company's Concept Blade speakers and aimed for an output capability equivalent to the KHT3005S. Available initially only in black, the KEF T105 system will be available from October 15th and will cost £1200. It will be joined by the T205 and T305 systems, selling for £1500 and £1700 respectively.